Traditionally, chile oil was a red Asian oil that gave heat to dishes. 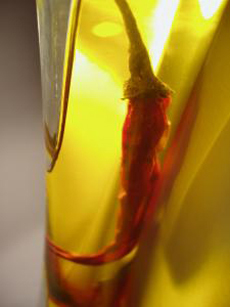 Today, gourmet chile oil can mean a high-quality oil infused with a hot chile. Photo by David Lee | SXC. How Many Types Of Cooking Oil Are There? There are scores of different oils used in baking, cooking and garnishing. The right selection depends on the exact purpose. Is the food to be baked, fried, sautéed, seared, stir-fried? Will the oil be part of a marinade or a salad dressing? Or will it be a garnish, an “anointing oil,” where a few drops of the best oil go a long way? There are two basic methods used for extracting the oil, cold extraction, which is how the finest oils are produced, and heat extraction, which produces refined oils. Both methods are described in the glossary below. If you think we should consider definitions than those we have provided, or you’d like to suggest additional words for inclusion, click here. Also see our Olive Oil Glossary and many other delicious food glossaries. This is Page 1 of a six-page glossary. To visit other pages, click the black links below. With a subtle toasted almond aroma and flavor, almond oil is used for salad dressings, sauces and desserts, although unlike almond extract, the oil is not concentrated enough to provide a strong almond taste to sweets. It has a high smoke point so it may be used for high heat cooking; but due to the high cost of nut oil, it most likely will not be used in this manner. Almond oil is a good source of monounsaturated fat and vitamins A and E.
A term for condiment oil: an oil with especially fine natural flavor and aroma that should be enjoyed as a surface accent, and not used for cooking or baking where the nuances will dissipate under heat. These oils are drizzled to add flavor to cooked meat, pasta, poultry, rice, seafood and vegetables, and as dipping oils. They are also used in vinaigrettes (or as a salad oil without vinegar—sometimes alone, sometimes with a splash of citrus juice). A lovely aromatic oil infused with the aroma and flavor of fresh apricots, apricot kernel oil is usually expeller pressed from the from the dried kernels of the apricot tree. 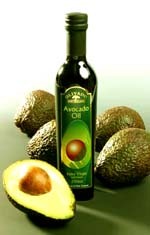 It is high in monounsaturated fat and contains no trans-fatty acids, so it is a very healthy oil. Its mild flavor makes it a pleasant oil for salad dressings. It is suitable for high heat cooking methods, such as sautéing and pan-frying. 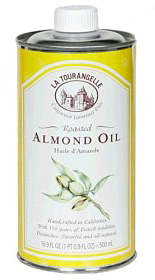 High-quality oils come from France. Pressed from argan nuts, which are native to southwestern Morocco, argan oil has a golden yellow color with a slight reddish tint and a pleasing nutty aroma. The flavor is similar to hazelnut oil, but somewhat sharper. It is used in salad dressings, cooking, and as a condiment, and is available in gourmet and specialty shops as well as Middle Eastern markets. Avocado oil has a flavor delightfully reminiscent of avocados. It has the highest smoke point of any plant oil, so it can be used for high heat cooking as well as for salad dressings or for use as a condiment. Infused avocado oils are processed to strip away the heavier avocado taste to let the flavor of the infusion shine through. Read our review of Olivado Infused Avocado Oil, a NIBBLE Top Pick Of The Week. There is nothing more delicious than butter. Butter can be used in baking and cooking (sautéing, stir frying, pan frying). While high in calories, saturated fat and cholesterol, butter is all-natural and a source of vitamin A and fat-soluble vitamins such as E, K and D, the antioxidant selenium, iodine. It is wonderful as a spread or as an ingredient in dips, marinades, sauces or any oven-baked dishes. Read more about butter and the different types of butter.